A decade ago, small sedans were the entry point into luxury-car ownership. But because of the increasing popularity of SUVs, automakers are scrambling to create new, stylish SUVs to attract those shoppers. The SUVs are smaller and more affordable than the already-familiar crop of luxury SUVs such as the Audi Q5 or the BMW X3. Often, they are the most affordable model in a brand’s lineup, making them even more important for carmakers hoping to win over new customers. Should you consider getting one of these new, small luxury SUVs? Here are the pros and cons of six new models, starting with the most affordable. All prices include destination fees. The Lexus UX has a few distinct advantages: It has the lowest cost of entry in the class ($33,025) and is the only one that comes in a hybrid version for increased fuel efficiency. We like the availability of the UX’s distinctive interior materials (such as the “washi” textured fabric, inspired by the grain of Japanese paper) and its small and maneuverable size. It’s an excellent city runabout. However, the UX’s back seat is tight, even for this diminutive segment, and its engines are the least powerful in the class. Also, the Lexus infotainment system, while attractive, has an interface that can be frustrating to use. The XC40 stands out thanks to a stylish design both inside and out. The sophisticated and thoroughly modern interior has a few handy tricks, such as a built-in waste bin and bag hook, but is small for the class. Volvo offers plenty of safety features on the XC40, too. Our biggest issues concern the uncomfortable front headrests and a steep learning curve for tech features. The infotainment system, for example, looks clean and impressive but takes a while to figure out. The XC40 starts at $34,195. Cadillac’s XT4 is the big boy of the entry-level SUV segment. Thanks to its larger footprint, it has class-leading rear legroom and a generous cargo area. We had a chance to drive the new XT4 recently, and its big-boy character doesn’t end with its dimensions: From behind the wheel, it feels more like a scaled-down large SUV than a scaled-up car. That’s unique in the class and might add appeal for some shoppers. The XT4 is comfortable to sit in and offers an extensive list of luxury upgrades and easy-to-use tech features, although those can quickly drive up the Caddy’s starting price of $35,790. With its Q3, Audi was one of the first luxury automakers to introduce an entry-level SUV. Now the Q3 will be redesigned for the 2019 model year, although it won’t be available in U.S. dealerships until July. We’ve had a chance to drive the 2019 Q3, and we think it’s a huge improvement in every way. It’s roomy and smooth-driving. But the Q3’s biggest appeal comes from the extensive list of available technology features. Nothing else in the class will have quite the same wow factor for tech-heads. There’s no official pricing yet, but we’d guess it will start around $36,000. Like Audi, BMW was another pioneer. Its X1 SUV set the standard for the entry-level luxury SUV class when it was introduced in 2012. Combining BMW dynamics with standout practicality, the current generation has been Edmunds’s favorite vehicle in the class. With the new 2019 X2, BMW is betting some shoppers will sacrifice a bit of practicality for an extra dose of performance and style. The X2 gives up both cargo space and rear headroom compared to the related X1, and it comes with a higher price tag: $37,395, versus the X1’s $34,895 starting price. But we’re sure the X2 will find traction with buyers who are willing to sacrifice a little space for more style and performance. With a sporty attitude, powerful optional engine and a well-trimmed interior, the E-Pace makes for a fun, if slightly pricey, small SUV. In fact, at $39,595, the E-Pace has the second-highest base price in the class, right after the corporate sibling on which it’s based, the Land Rover Range Rover Evoque. The E-Pace is a more road-focused machine that’s fun to drive. It has big wheels and tires, athletic handling and a firm ride. But compared to some competitors, there’s less interior space, and Jaguar’s infotainment interface isn’t the best. 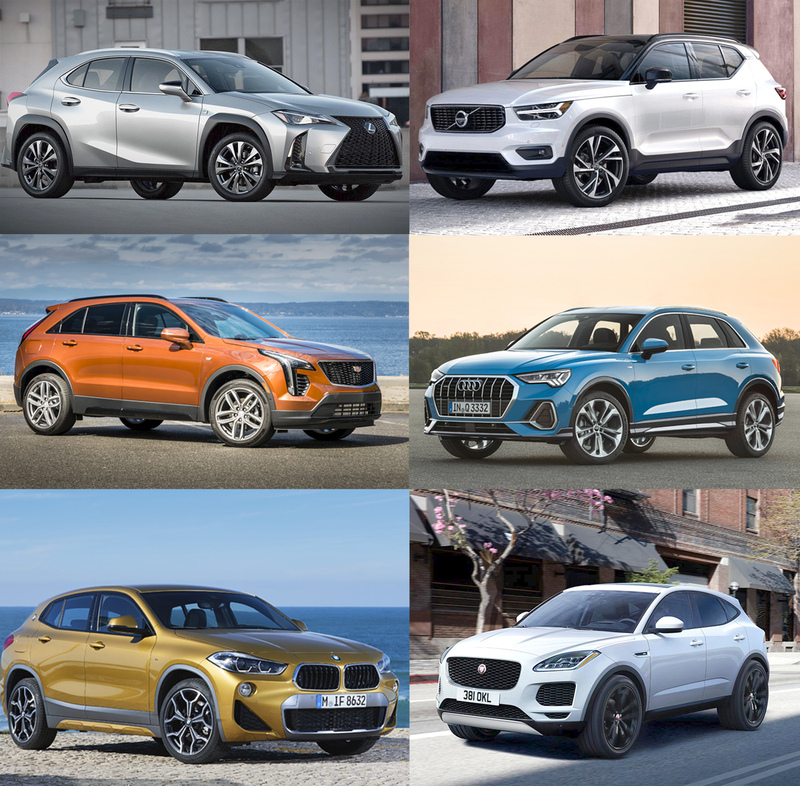 The entry-level luxury SUV class has gone from almost nonexistent to jam-packed with fresh and diverse vehicles in just a few years. It’s an important growth area for automakers and provides a lot of choices for consumers who are transitioning into the luxury market or downsizing from larger luxury vehicles. This story was provided to The Associated Press by the automotive website Edmunds. Will Kaufman is a staff writer at Edmunds. Instagram: @didntreadthestyleguide.